Chocolate, Peanut Butter & Banana breakfast Quinoa – Kid approved! Mash the banana & peanut butter together in a bowl with a fork. Next add in the cacao powder, vanilla & stevia and stir until well combined. Finally mix the cooked quinoa into the banana mixture & enjoy! Quinoa Fruit Salad – only 175 calories! This is currently the ONLY way that I can get my 4 year old to eat Quinoa, but it’s a start! In a small bowl combine the agave nectar & lemon juice. Cut up all of the fruit and mix together with the precooked quinoa and top with the lemon dressing! 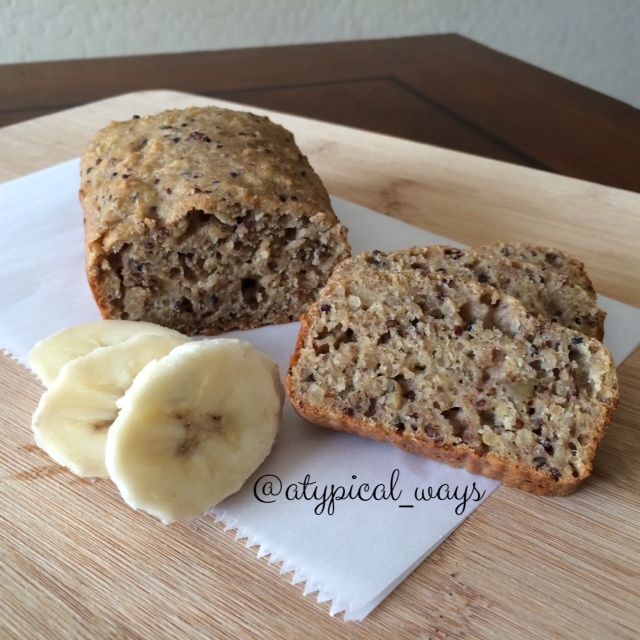 Quinoa Banana Bread with Walnuts! Quinoa Banana Bread – Same recipe as my banana bread quinoa cooks baked in a mini loaf pan at 350 degrees for 30 minutes. So after making my Quinoa Banana Bread cookies yesterday I was curious if the same dough would work for a bread too…..well VOILA, it does! Same recipe as yesterday but baked in mini loaf pans for 30 minutes at 350 degrees. Combine quinoa & water in a small saucepan. Cover pot and bring to a boil. Reduce heat and simmer for about 15 minutes. Remove lid, fluff with a fork and set aside. Once the quinoa has mostly cooled, measure out 1.5 cups and add it into a large mixing bowl with the flour, flax seed & cinnamon. In a small bowl mash the banana with a fork until it becomes like a paste. Add in the oil, eggs, vanilla & agave and stir until well combined. Pour the wet mixture into the dry mixture until well combined and then fold in the walnuts if you choose. The dough will be slightly wet so allow it to rest in the refrigerator for about 30 minutes and it will firm up. Pre heat oven to 350 degrees. Place in parchment lined mini loaf pans and bake for 30 minutes! 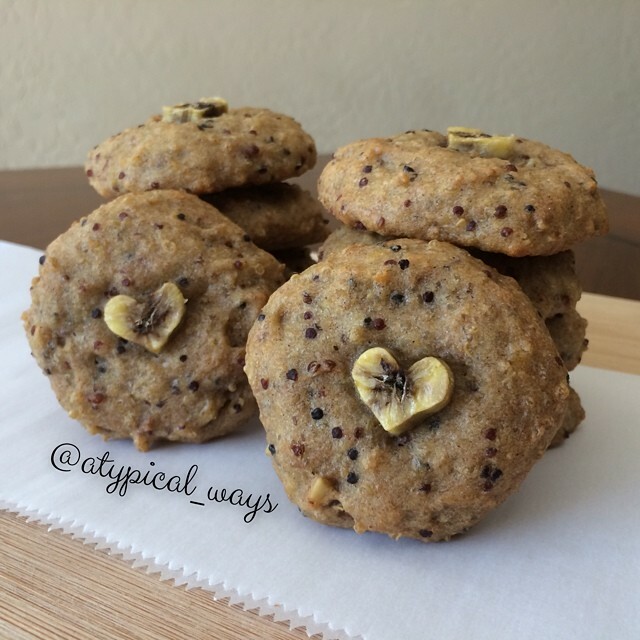 Gluten Free Banana Bread Cookies with Walnuts & Tri-Color Quinoa! Gluten Free Banana Bread Cookies with Walnuts and tri-color quinoa! Pour the wet mixture into the dry mixture until well combined and then fold in the walnuts if you choose. The dough will be slightly wet so allow it to rest in the refrigerator for about 30-60 minutes and it will firm up. Pre heat oven to 350 degrees. Place heaping tablespoons of dough onto a parchment lined baking sheet. Form into desired shape as they will not change shape/size while cooking. Top with some additional banana if you choose, and bake in the oven for about 22 minutes. Allow to cool slightly before removing to a cooling rack as they will be very soft until they have cooled. Same recipe baked in a mini loaf pan at 350 degrees for 30 minutes. 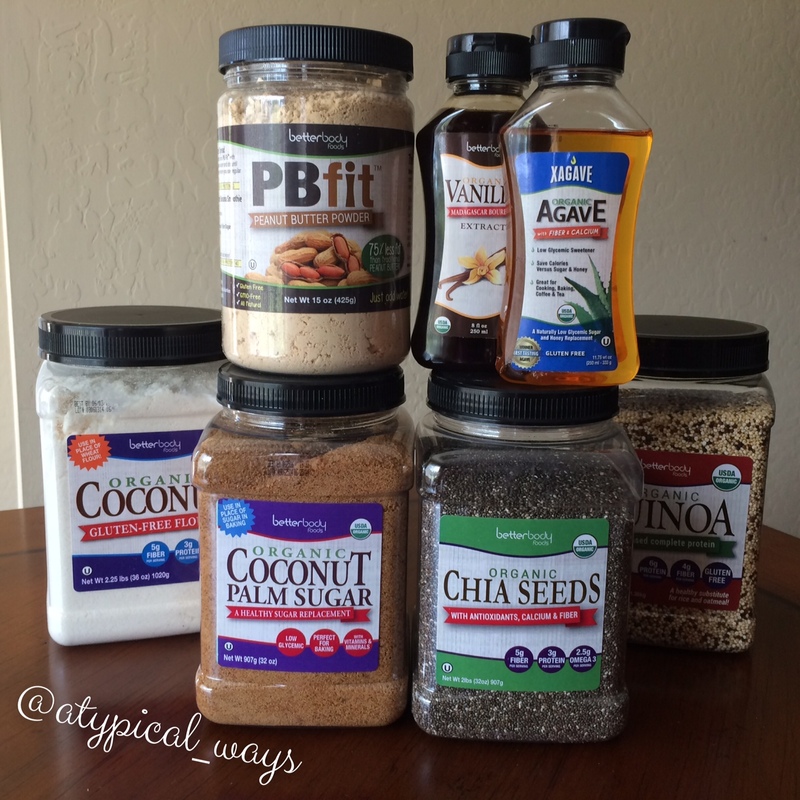 Ok, so I might have gotten a little carried away with Better Body Foods…but I seriously can’t wait to try all of these! Today was my first day EVER using Coconut Palm Sugar. I used it to make the Candied Bacon in my pancake entry. And I’m planning to use the vanilla & agave tomorrow for some homemade granola & roasted nuts. Yum! And a brownie recipe in the works with the PB fit! I’m a total sucker for new products. I may have a ‘small’ online shopping problem.